Before collection takes place an email confirming goods are ready to collect will be sent and extra collection infomation will be given. Once goods are dispatched for delivery a confirmation email with all delivery infomation will be sent. Over 90% of orders are despatched by carrier. The remaining lighter ones will be sent by Royal Mail. Certain specialist goods will be delivered with our own personnel delivery service. Unfortunately we only accept orders made by the card holder and cannot deliver to PO box addresses. Please note we cannot guarantee delivery services as we rely on a third party (our carrier), however over 98.5% of deliveries are achieved on time. 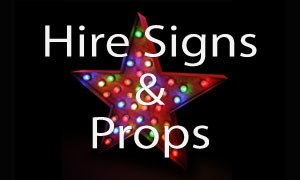 All deliveries are supplied with an invoice detailing all prices & products. Should you lose this, please contact us for another copy. We do not offer a timed delivery service. Deliveries are generally between 8:00am and 5:30pm, Monday through Friday. We are not able to be more specific on courier delivery times. Saturday deliveries can be arranged on certain products for an additional charge. Our security policy is to only supply goods to the cardholders address. 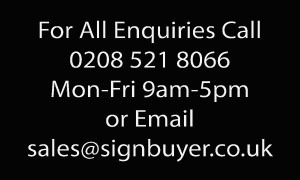 If the delivery address is other than that of the cardholder address you must contact us at Customerservices@signbuyer.co.uk. Our Online site requires you to input the cardholder address and delivery address. If delivery address is different to the billing address this will delay your order. 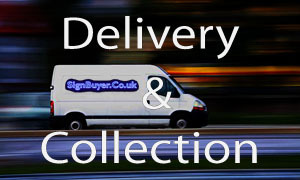 Worldwide despatch is no problem.Our Export Sales Department at Sales@signbuyer.co.uk are happy to provide quotations for delivering any quantity of signs for any country.